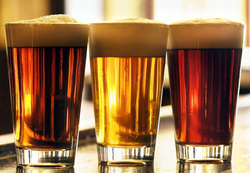 Beer Styles - THIRST FOR KNOWLEDGE® INC. While there are many established beer styles around the world, brewers are redefining the century old standards of the categories of beer styles. When shopping for beer, it is almost impossible to shop by style. Many retailers are offering beers segmented by country, by brand and then by style. Even in the local bar or pub, you will very seldom find beers by style. The good thing is that many servers and bartenders are now becoming knowledgeable about beer. One very simple way of looking at beer is to compare them to wine. In very general terms, ales are like red wines (more flavourful, more aromatic and should be served at warmer temperatures with fuller tasting foods). Therefore, lagers are typically like white wines (lighter, more refreshing with fewer aromas and flavours and should be served colder with lighter foods). Simple to start but a massive generalization. The document below should help to understand a variety of different styles.